New Jobs At Etihad Airways Abu Dhabi .Etihad Airways is the United Arab Emirates' 2nd largest airline with its head office being located in Abu Dhabi, close to the International Airport. The airline began its operations in 2003 and now operates over 1000 flights weekly to more than 120 destinations across Africa, the Middle East, Asia, Europe, the Americas and Australia, operating a fleet of 122 aircraft. Carrying over 14 million passengers a year, this is a large and prestigious employer offering many job opportunities to people at all stages of their career and in a number of fields. If you are interested in finding out more about new jobs at Etihad Airways Abu Dhabi, read on. What Kind Of New Jobs At Etihad Airways Abu Dhabi Are There? If you are interested in applying for new jobs at Etihad Airways Abu Dhabi, the kind of skills and experience that you must have will vary. For some positions, all that is required is a good standard of high school education, however for others you will have to have relevant qualifications and several years of experience in a similar field. Good communication skills are very important for many jobs, and multi-lingual skills are an added bonus. Customer service skills and interpersonal skills are also key to many roles which come into contact with the public and computer skills are also essential in many jobs too. For some posts you will have to comply with certain physical characteristics. For example, as cabin crew you will not be able to have any visible piercings or tattoos and be tall enough to reach up to a height of 210 cm. Cabin crew applicants must also be able to swim and must have no criminal record as well as being able to meet all medical screening requirements. 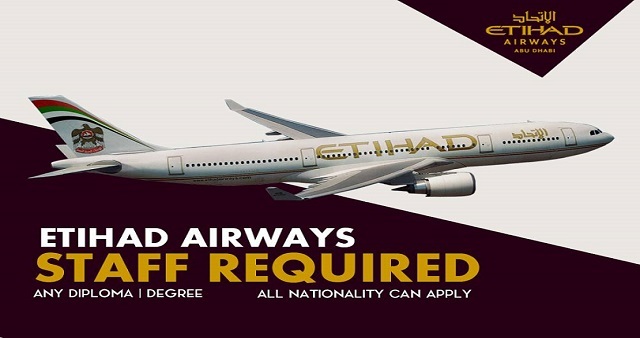 The latest positions which are vacant at Etihad Airways are all listed on the company's own website, so this should be your first port of call when searching for new jobs with this airline. By clicking on the careers section you can search for vacancies by category, location or keyword so that you can find the job that best suits your requirements. If you see a position on the Ethad Airways website that you are interested in and for which you think you meet the essential applicant criteria, you can apply through the website itself. You can also apply through LinkedIn. Alternatively, if you cannot see a role that you think you are suited to, you can apply to join the airline's talent community. This will enable you to be contacted by a recruiter from the airline if a vacancy arises that is suited to your skills and experience. By joining the talent pool, you will be opening your options to a much wider choice of positions and this will save you time over having to perform regular job searches yourself.